FREE* Home Security System with $0 professional installation and activation for as low as $34.99/month. Must be a homeowner to qualify for this offer. Requires 36-month monitoring contract, ACH automatic payments, and qualified credit approval. Other options are available for non-homeowners. Please contact us at 1(800) 616-1097 or fill out our online form for a free quote. By clicking the “Submit” button, you consent for an Alarmit Security, LLC specialist to contact you at the email provided about Alarmit Security, LLC offers. This consent is not required to make a purchase. Clicking the “Submit” button constitutes my electronic signature. Get the Award-Winning IQ Panel 2 with 1 motion detector, 3 door/window contacts, 2 HD 1080p outdoor cameras, and 1 HD 1080p indoor camera. $199 installation with 36-month monitoring contract. $59.99/month monitoring. What if you could reduce false dispatches, improve response times, and have every member on the account reached at the exact same time? Now you can. Every alarm contact can now receive a group text invitation simultaneously in the event of an alarm. Group members can then text with each other and decide if it’s a false alarm or to dispatch the police. This reduces false alarms, and dispatch times. In a meeting? No problem. Don’t miss anymore calls from your Central Station when your alarm goes off. 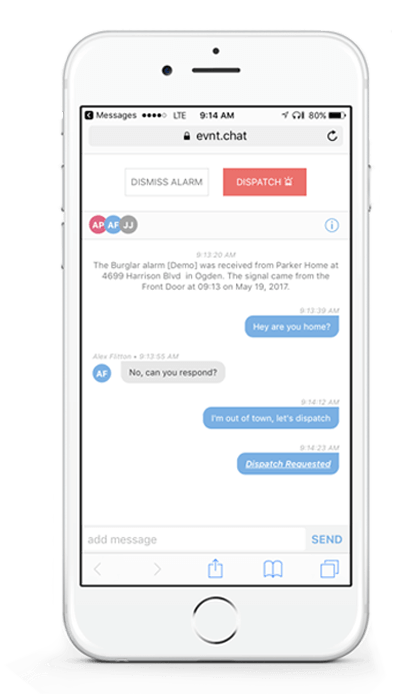 You can now reply to alarm events discreetly via text using Alarm Chat. Select from one of our Smart Monitoring Plans below or schedule a free home consultation with one of our specialists. Must be a home owner to qualify for this offers. All plans require a 36-month monitoring contract, qualified credit approval, and ACH Debit monthly payments. Other options are available for non-home owners. Please contact (800) 616-1097 for more information. What additional protection do you need? Already own a security system? Let us monitor it for you. We can now upgrade your traditional existing hardwired security system and give it all the interactive features that our modern security systems already have. If we can’t, we’ll replace it. We strive in being the leaders in providing our customers with state of the art home security systems and interactive services. Our reliable home security systems offer the latest features and are upgradable to meet every homes’ demands. With our home security systems, You can rest assured you will be receiving the best in class award-winning technology. Copyright © 2018 Alarmit Security, LLC. All rights reserved.